Tonight for dinner we had bar-b-que meatballs, potato salad, and kale. Sorry no pics, we ate before I had a chance to get my camera. :-( But, I did want to share what I used for the meatballs. 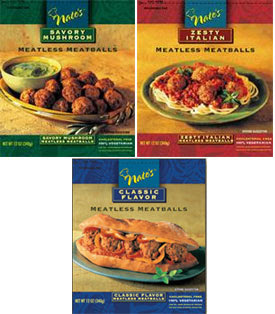 These are Nate's meatless meatballs. I used the classic flavor and made my own sauce. I sauteed onions, shallots, and garlic with olive oil then added a cup of ketchup, tbsp of molasses, tsp of agave, tsp of mustard, tsp soy sauce. To taste I added, garlic powder, hot sauce, paprika, and a dash of ginger. I added water to thin it out a little. Stirred and simmered and then poured the sauce over the meatballs in a baking dish and then put them in a 350 oven for 20 mins. Heaven!